WORLD RECORD in his field of art CALLIGRAPHY. A journalist, a poet, a calligraphic artist, a cartoonist, a short-story writer… adjectives galore for Khaleelullah Chemnad. This multi-talented personality, who has marked his own imprint in all the fields he has attempted, has received recognition everywhere. As the life of his father, who was a famous poet and writer, was left before him like an open book, Khaleel did not take much time to find his own way. However, his was a new path, which was a synchronization of writing and drawing. Literature was so dear to this talented personality from childhood when he used to carry works of famous literary personalities along with his school books. He had started publishing stories, poems and cartoons in children’s magazines at a tender age. Mohammed Hassan Khaleelullah born on 17 January 1972 in Chemnad village of Kasaragod District. His father M. H. Seethi is a well known writer and social worker and mother is a house wife. Khaleel was in fond of Art and literature and at the age of 13 he started to draw calligraphy . It was a period in which calligraphy was a Rocket Science for most of the Indians. To mark his footprints in Arabic calligraphy , based on his calibre and his knowledge on classic calligraphy Khaleelullah opened new horizons. Thus, 23 years back a new art form in calligraphy is amazed the world as it is first in its kind and unique in its beauty. The first of its kind took birth in magic fingers of this Young man – Anatomic calligraphy . He draw the picture of one of the world’s most visionary ruler – Shiekh Zahid Bin Sultan Al Nahyan using the Anatomic calligraphy. It was the time where only Zoomorphic drawings were in place. Thus Khaleelullah walked into the hall of fame. 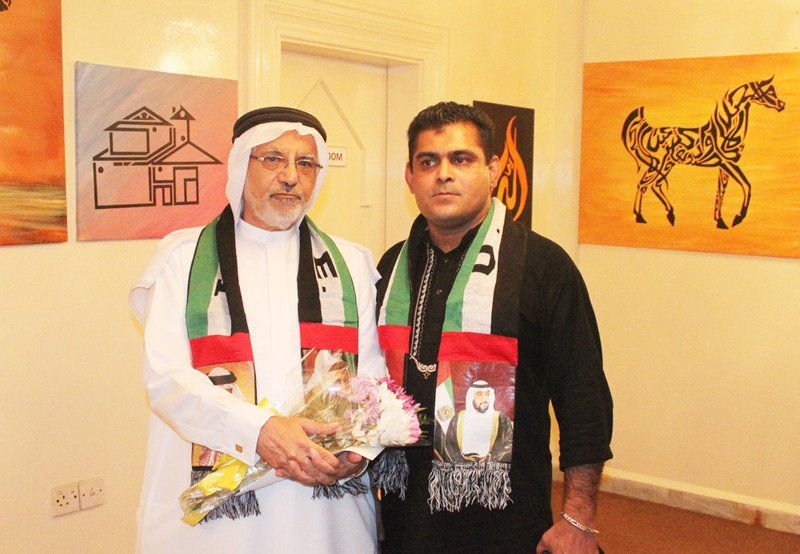 Young Khaleel got inspiration to choose calligraphy as his field seeing the artistic beauty of the letters in the Arabic magazines, which used to come to his father’s address from UAE, Iran, Iraq, Saudi Arabia and Qatar. Even though Khaleel was not proficient in Arabic language, his calligraphic works became inevitable for the regional publications in India due to its sheer quality and beauty. Since 1987, when he was only 15, Khaleel started drawing calligraphic pictures for two publications in Kerala. His unique talent in calligraphy got noticed very quickly, especially because he was a non-Arab, a specialty, which enhanced the significance of his works. In 2010 Khaleel bagged a world record by drawing the biggest anatomic calligraphic picture of Sheikh Mohammed – ruler of Dubai. Limca Book of Record also marked in its kind. Further, first time in India 50 Qur Anic versus carved in oak wood using calligraphic scripts and placed in a mosque named Kalanad Mosque in Kerala. This world know calligrapher marked his presence and continues his journeys to many well know calligraphic conferences and exhibitions throughout the world. 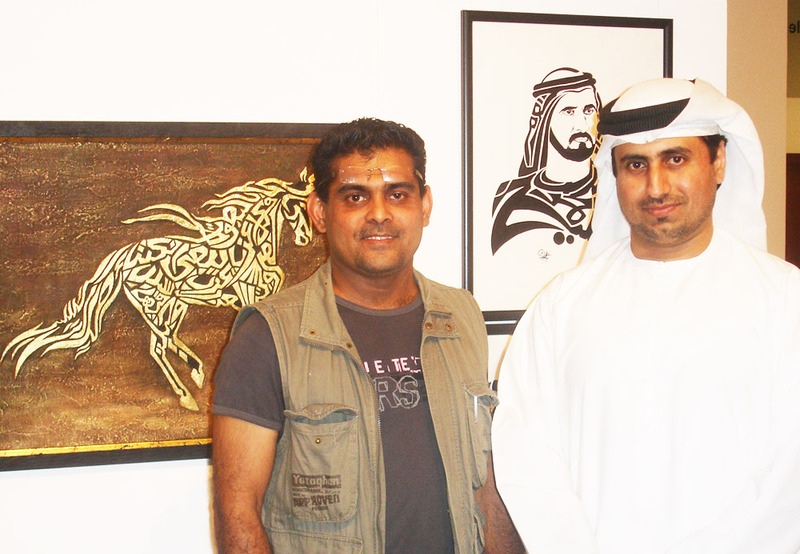 His calligraphic Logos are a Prestige mark of many top ranked firms in UAE. Khaleel has in his kitty 15 awards for art and literature including the Kerala Cartoon Academy Award, which he won at a very young age, World Health Organization Award, Thoolika Award, Malayattoor Award, MP Narayana Pillai Award and Anti-Narcotic Movement Award. Khaleel, who creates wonders with Arabic letters through his calligraphic works, has today established himself as a different artist in the field of Arabic calligraphy and has acquired the recognition of Arab people at large. “I believe that my best calligraphy is yet to be drawn. It is my dream, project. It could be a great work of anatomic calligraphy and its should be a land mark in the world history” says Khaleel.